During annual report season, we’d always look for a good location to photograph the company’s top executives. We’d get permission to roam around the headquarters—or an off-site location—with the client and the photographer (in this case, J. Craig Sweat) to take a few test portraits. This 35mm film strip and enlarged test photo were taken in early 1990 for The Washington Water Power Company (now Avista). That’s me (left) with the client’s project manager, Pat Lynch. We’re doing our best imitation of both the chairman of the board/CEO and the president/COO. 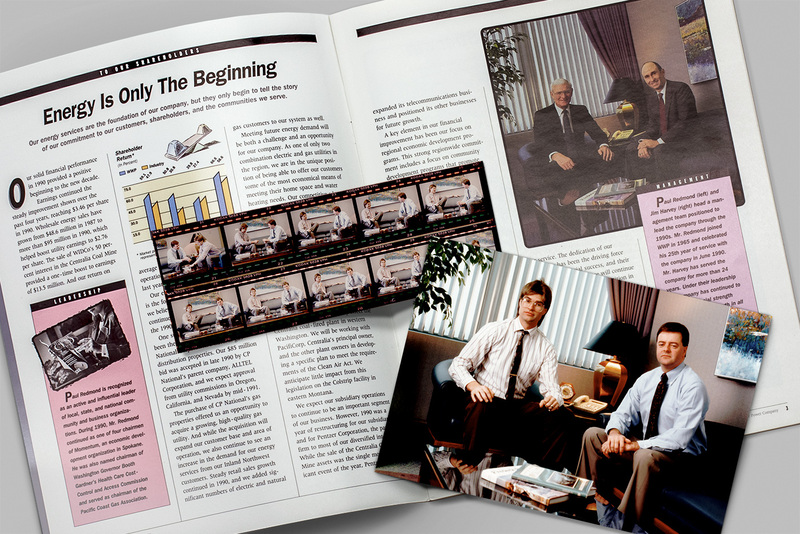 The actual executive photo is above Pat and me, in a spread from the the company’s 1989 annual report. Remarkably, even the hand positions are similar.